This puzzle is a champion. 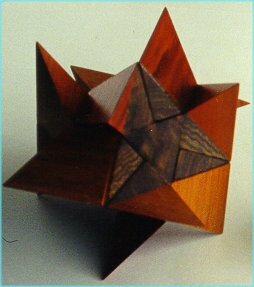 It's got only four parts, assembles in two different shapes: Regular and Chaotic. 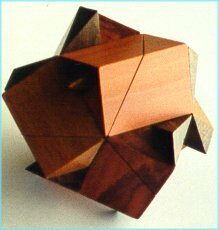 Quadro-Inverto holds another puzzle inside. So it's sort of a Box Puzzle. 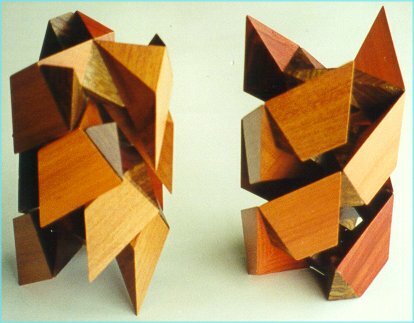 The parts are stackable - in case you don't have time to put it together, and the stack itself is an attractive sculpture. 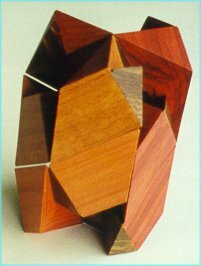 Regular assembly - the puzzle looks smooth and has a hollow space inside which holds another puzzle - we used a famous two-piece pyramid. Quadro-Inverto is a four-piece coordinate motion puzzle. To put it together you have to slide all four parts to the center simultaneously. 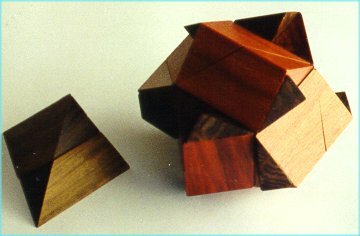 The puzzle can form several different stacks out of two or all four parts. 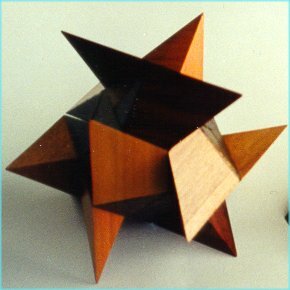 Chaotic assembly - It's completely solid - there is absolutely no empty room inside.